Welcome to THE WORLD OF CHARLEY CHASE, the first and only Charley Chase website. Charley Chase was an incredibly prolific star comedian of the 1920s and 1930s who produced hundreds of short comedies in both the silent and the sound eras. His work behind the scenes as a writer/director of his own films and of countless others has cemented his reputation as one of the principal architects of early film comedy. Established in 1996, this website is intended to serve both early cinema aficionados as well as those less familiar with this comic pioneer. The Sprocket Vault is releasing some of Charley Chase's sound-era comedies on DVD. Charley Chase: The Hal Roach Talkies, Volume One 1930-31 is available for order exclusively on Amazon and will feature the following short comedies across two DVDs: The Real McCoy, Whispering Whoopee, All Teed Up, Fifty Million Husbands, Fast Work, Girl Shock, Dollar Dizzy, Looser Than Loose, High C's, Thundering Tenors, The Pip from Pittsburg, Rough Seas, One of the Smiths, The Panic Is On, Skip the Maloo!, What a Bozo!, and The Hasty Marriage. As a bonus, the set will also include the Spanish-language version of The Pip from Pittsburg, La Senorita De Chicago. More information can be found on Silent Comedy Mafia. Other releases may follow if sales are brisk for this first volume. New and highly recommended, Brian Anthony and Bill Walker's Charley Chase Scrapbook chronicles the comedian's life and career through rare photographs, lobby cards, posters, letters, news clippings, and interviews, much of which come from Chase's own personal scrapbook. A veritable archive of Chase lore with a wealth of images, the book is beautifully assembled and includes illuminating quotes from the comedian's friends and family. This volume is a treasure trove of documents and ephemera, containing some of Chase's vaudeville songs written in his own hand, promotional material from the Hal Roach Studio, the complete shooting script for The Pip From Pittsburgh, behind-the-scenes photos, and much more. The Charley Chase Scrapbook is a terrific companion to Brian Anthony's wonderful biography, Smile When the Raindrops Fall, and is available for purchase here. Recently published, Craig Calman's new book on Hal Roach is a detailed overview of the producer's storied career and also includes anecdotes from the author's personal acquaintance with this Hollywood luminary. The book provides a history of the Hal Roach Studios, containing much on Roach's legendary comedy output, which spanned the Laurel & Hardy and Our Gang series and an early association with Harold Lloyd. Of particular interest to readers of this site is the information on Charley Chase as well as on his brother, James Parrott, and their work at Roach's studio. Craig Calman's 100 Years of Brodies with Hal Roach is available from Amazon and is published by BearManor Media. Steve Massa's Lame Brains and Lunatics is a meticulously researched examination of "the good, the bad, and the forgotten of silent comedy" by one of the leading experts in the field, featuring profiles of Roscoe "Fatty" Arbuckle, Mack Sennett, W. C. Fields, and Marie Dressler; lesser known performers, such as comediennes Alice Howell and Gale Henry; and many other early film comedy practitioners, including Marcel Perez, Billie Ritchie, and George Rowe. A chapter that will be of great interest to Charley Chase fans is a detailed study of Chase's career as a director (under his real name, Charles Parrott), and another on Hal Roach colleague Max Davidson and his on-screen family. Richard M. Roberts's Smileage Guaranteed: Past Humor Present Laughter, The Comedy Film Industry, 1910-1945, Volume One: Hal Roach is a history of the Hal Roach Studios with an emphasis on often overlooked yet influential figures such as Chase, Davidson, and Snub Pollard, as well as those who had made the "Lot of Fun" their home only briefly, like Mabel Normand and Harry Langdon. Lavishly illustrated and boasting a thorough Hal Roach filmography, the book provides further insight into one of the premiere comedy studios of the golden age, with the promise of two more volumes to come on the comedy film industry during this period. James L. Neibaur's The Charley Chase Talkies, 1929-1940 is a film-by-film analysis of the 79 sound-era short subjects that Chase turned out at Hal Roach and Columbia Studios. The first full-length book on the comedian's talkies -- with many of these Roach shorts having aired on Turner Classic Movies in the past few years, and the Columbias released on DVD in 2013 -- this is a must-have for Chase aficionados and enthusiasts of early sound comedy alike. 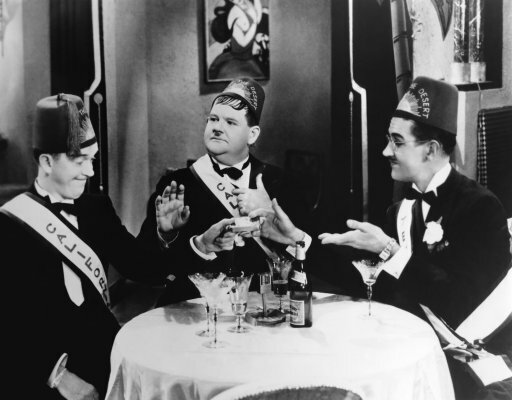 The Library of Congress has announced the 25 films inducted into the 2012 National Film Registry, and among them is Sons of the Desert, the Laurel and Hardy feature film in which Charley Chase plays a 'darb' of a supporting role. The duo's 1933 comedy is often ranked as one of their best features, in part due to an iconic scene between Chase and his fellow Hal Roach Studio colleagues at a rowdy convention of their fraternal lodge. Each year, the Library of Congress selects twenty-five American films that are "culturally, historically, or aesthetically significant" for inclusion in the list. This film is the third Laurel and Hardy comedy included in the Registry, after their celebrated silent Big Business (1929) and their talkie masterpiece The Music Box (1932). Sons of the Desert is also the third film inducted into the National Film Registry featuring Charley Chase, the others being Mabel's Blunder (1914) - an early Keystone one-reeler starring Mabel Normand which features a young Charles Parrott in its supporting cast - as well as Chase's own silent classic Mighty Like a Moose (1926). For more on the National Film Registry and this year's inducted films, see the Library of Congress website. The four-disc DVD collection Becoming Charley Chase was released in July 2009. The All Day Entertainment-produced set, distributed by VCI Entertainment, features Chase's early work at Mack Sennett's Keystone Studio, his directorial efforts of the 1910s and '20s, as well as the extant run of his one-reel Jimmy Jump shorts plus a few early two-reelers. Here is a full list of the DVD set's contents; all in all, the set boasts over forty short comedies, with all shorts supplemented by audio commentaries by various film scholars. The comedies included in this collection do not overlap with any previous Charley Chase DVD release. Click here to access All Day's online booklet for Becoming Charley Chase (opens in Adobe), which features liner notes, rare photographs, production credits, and essays. You can order Becoming Charley Chase directly from VCI. This DVD set has received some good publicity thanks to positive write-ups in The New York Times, DVD Talk, The Los Angeles Times, Rogue Cinema, Thrilling Days of Yesteryear, and Examiner.com. Chris Seguin, Rick Levinson, Stan Taffel, Rob Farr, John V. Brennan, and Cole Johnson. Copyright (c) 1996-2018. All Rights Reserved. and cannot be reproduced, in whole or in part, without their expressed written permission.